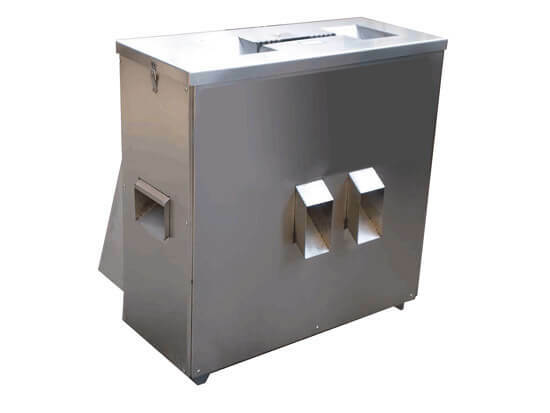 The chili cutting machine is used to cut all kinds of fresh pepper and dry pepper, it can cut chili into segments, shreds, and circles; chili head and chili stem are also cut at the same time. The size of the chili cutting can be adjusted by the customers. It is the most professional equipment for processing chili in China. 1. Convenient and efficient, one or two people can operate it. 2. The cut chili is smooth and even without any damage to the fiber of the chili. 3. Eco-friendly, energy-saving and high production efficiency. 4. Simple to clean and maintain, low malfunction rate. 5. It can cut the pepper into the section, shred and circle, can also remove the pepper head and stem. 6. The size of the chili cutting can be adjusted as you want. 1. It can be used to cut various fresh chili and dry chili. 2. It is widely used in the kitchen, restaurant, school, hotel, army, and other vegetable process factory. 3. For the vegetable processing factory, it is a necessary machine for chili dehydrating, freezing, curing, etc further chili processing. 1. The machine should be placed on the level work site. 3. When working, don’t put foreign matters into the chili to avoid damage to the machine; don’t put hands into the working chamber to ensure safety. 4. After working, clean the machine in time to keep the machine a good performance. Chilli is one of most important condiment in our life, adding it to the food can make the food more delicious. Eating chili healthily is also very necessary. 3. In the dry season, please eat less chili.